LIFE IS BEST WHEN GOD IS FIRST. A life that is lived without a plan does not work very well, and a plan that is not clear, and manageable on some daily basis, will not lead to success. A plan is like GPS. You first choose your desired destination. Then a plan is formulated as the best way to get there. That could and should be applied to everyday life. A life that is lived without a plan does not work very well. And any plan that is not clear and manageable on some daily basis will not lead to success. Some years ago, a simple yet practical strategy became popular, “Plan the work; work the plan.” Solomon learned that, “Good planning and hard work lead to prosperity, but hasty shortcuts lead to poverty.” Proverbs 21:5 NLT. That remains wise advice in any circumstance. When you plan, you visualize the priority and time required for the various matters requiring your efforts. When you neglect those moments to think through a day’s responsibilities, you find yourself busy but less productive. Without a plan for the day, energy is misspent, and efforts are less effective. Attention is easily divvied and distracted. Time is poorly allocated. I have learned that important things are often replaced by alternatives that seem easier and more immediately enjoyable. Direction is necessary for production. Now, let’s look at this on a larger scale with more eternal consequence. This principle especially applies to your spiritual life, as well as your daily life. Those two are inseparable, by the way. You will be more successful at the latter, when you succeed at the former. You cannot successfully compartmentalize your life into differing categories, seasons, or circumstances, in some of which you retain operational control while in others you are expecting God to direct and bless. Jesus is Lord of all, or He is not Lord at all. Jesus made this clear, “Seek first the Kingdom of God and His righteousness and all these things will be added to you.” Matthew 6:33. Often, my Dad reminded me, “Allen, first things first!” It’s very simple really. First, you work, then you play. First, you save, then you spend. First, you seek God’s plan, then you follow His plan. “For we are God’s masterpiece. He has created us anew in Christ Jesus, so that we can do the good things He planned for us long ago.” Read Ephesians 2:8-10 NLT. You and your wellbeing have been in God’s plans from the beginning and continue to be. Life is best when God is first. God has the definitive plan for your life. Scripture is consistent. “For I know the plans that I have for you, declares the Lord, plans for your good and not harm, to give you a future and a hope.” Jeremiah 29:11 NKJV. “As for God, His way is perfect; the word of the Lord is flawless.” Psalm 18:30 NIV. Through prayer and Scripture, let God plan your work. 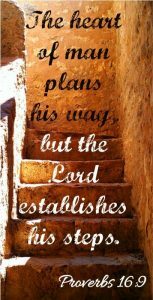 “We can make our plans, but the Lord determines our steps.” Proverbs 16:9 NLT. That being true, then devote yourself to knowing and following His plan. That is called obedience, a priority to God and a necessity for your success. Obedience will supply you with the necessary focus and ability you do not otherwise possess. Obedience will produce opportunities you neither earned nor expected. And obedience will yield achievement you do not imagine. God’s direction is always accurate; His timing is always exact; His results are always abundant. Today I pray for you to discover God’s purpose in all you do and with all you have. God has a hope-filled future for you; plan accordingly. Plans. Plans connect you to your future, or at least you suppose they will. Everyone makes them and should, but not every plan comes to fruition. We are somewhat limited. We know the past, even if we have not learned from it. And we are fairly aware of the present, even when we are not as fully engaged as we should be. But as to the future, we can only guess. That limitation makes even your best plans incomplete. The philosophy of our secular culture is, “Plan your work and work your plan.” But where is God in that advice? I heard a person described as, “not having an eraser.” As I got to know them better, I realized the accuracy of their description. They were not at all flexible. The Psalmist described the tragedy of people whose plans fail to include God. “When their breathing stops, they return to the earth, and in a moment, all their plans come to an end.” Psalm 146:4 NLT. Life is wasted by those who do not put God first in their plans. Why waste time, energy, or irreplaceable resource on plans that fail to include God? Make sure your plans touch eternity. “In his heart a man plans his course, but the Lord determines his steps.” Proverbs 16:9 NIV. It’s your choice, His plans or yours? Your aspirations for the future are best when submitted to His wiser direction. 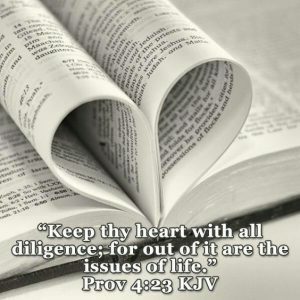 By experience, Solomon learned, “Trust in the Lord with all your heart, and lean not on your own understanding; in all your ways, acknowledge Him, and He shall direct your paths.” Proverbs 3:5-6 NKJV. Wouldn’t it be wonderful if you could just know the future? Or even if you knew someone who did know the future? There is One who does. God said, “For I know the plans I have for you,” declares the Lord, “plans to prosper you and not to harm you, plans to give you hope and a future.” Jeremiah 29:11 NIV. 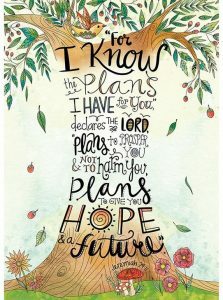 God has a hope-filled future for you; plan accordingly. Hope without a future would be meaningless; a future without hope would be despairing. As a boy, I remember my mother singing at her piano, “Many things about tomorrow, I can’t seem to understand. But I know Who holds tomorrow, and I know He holds my hand.” You can live every day with strength and confidence. “I trust in you, O Lord; I say, ‘You are my God.’ My times are in your hands.” Psalm 31:14-15 NIV. God offers you a future filled with hope and a hope that fills your future. “The steps of the Godly are directed by the Lord. He delights in every detail of their lives.” Psalm 37:23 NLT. Today, I pray for you to rest your hope and future upon God’s character and faithfulness. Whatever good toward God or man will be returned from God’s own hand. “Whatever good anyone does, he will receive the same from the Lord.” Ephesians 6:8 NKJV. There is a simple lesson in life. What you do and say, whether good or bad, eventually comes back to you in some form of either kindness or distress. Because you feel like speaking or behaving in a certain way does not mean that you should. When you give and what you give determine what you will receive. Therefore, it would only be wise to consider carefully the effect of what you do or say before doing so. Solomon wisely observed, “Your reward depends on what you say and what you do; you will get what you deserve.” Proverbs 12:14 TEV. Now that can be either encouraging or terrifying. It’s great to know that God rewards goodness; It is not so comforting to realize that He does not spare you the bitter fruit of wrongdoing. The Bible calls that sowing and reaping: “For he who sows to the flesh will of the flesh reap corruption. He who sows to the Spirit will of the Spirit reap everlasting life.” Galatians 6:7-10 NKJV. 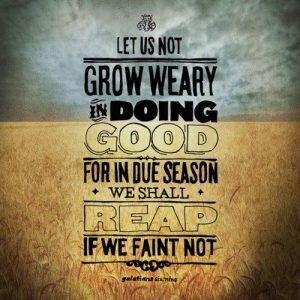 Whenever you are not reaping enough, you are not sowing enough. 2 Corinthians 9:6-11 NIV. As a child, I remember my grandfather McGinness saying, “God will be no man’s debtor.” I have come to understand what he meant by that. A simple rhyme comes to mind: “Whatever good toward God or man, will be returned from God’s own hand.” My grandfather had learned that whatever good is done, toward God or man, will be returned with added blessing from God, in one way or another at one time or another. God lets no good go unrewarded, however unnoticed by others. Your return may not always come from an expected source, but your reward always comes from the true Source of all that is good. God uses whom He chooses to do His work. Here’s the practical lesson in this. Never hesitate to do what is right or to deal generously when you can; those opportunities come your way with God’s promise of blessing and enrichment. Conversely, never do what you know is wrong, nor withhold what you know is due, however small or secret that may at first appear. Solomon was specific. “Do not withhold good from those to whom it is due, when it is the power of your hand to do so.” Proverbs 3:27 NLT. There is a moral law. Good comes from the good you do or the grace God gives. You can count this to be true, “Serve wholeheartedly, as if you were serving the Lord, not men, because you know that the Lord will reward everyone for whatever good he does.” Ephesians 6:7-8 NKJV. You may not realize the connection with a previous occasion at that moment, but God does, and remembers and rewards accordingly. Today, I pray for you to do good freely and receive reward extravagantly. You may be receiving “Abounding Life” twice, we were notified that the majority of readers did not receive this devotional because of a server error. We want to provide this devotional for those who did not receive it. We apologize for that. Know that much time and effort has been invested in rectifying this technical problem. We trust the error has been corrected. And watch your Monday email for my thoughts on, “Living Passionately.” Spiritual life weakens when passion lessens.